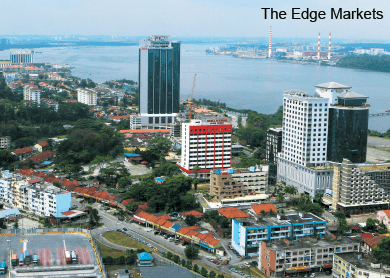 PRICES of homes on Johor Baru’s secondary market remain firm in 1Q2015, according to The Edge-KGV International Property Consultants Johor Baru Housing Monitor for the period. Prices held firm for the second straight quarter in most places sampled by the monitor. Price growth of certain property types — such as 1-storey terraced houses in Taman Nusa Bistari and Taman Mount Austin, 2-storey terraced houses in Taman Setia Indah, Taman Nusa Bayu and Taman Setia Tropika — remained flat for at least three consecutive quarters. The values of all high-rise homes in the monitor stayed firm for the past nine months to one-and-a-half years. While anecdotes from property agents suggest that sales have slowed, data on transactions in 1Q from the National Property Information Centre (Napic) for the period has not been released yet, hence it is still “premature to comment” on the amount of transactions, says Samuel Tan, KGV International Property Consultants (Johor) Sdn Bhd director. “My take on the same prices prevailing for the second straight quarter could be… the cautious stance taken by buyers. Most of them were, and are, careful not to overprice their purchase,” he tells City & Country. Likewise, the consultancy also found that primary market sales have waned over the quarter on poorer sentiment. There were few launches in 1Q2015. Of the four landed schemes that were introduced to the market, Sutera 18 — at Bandar Selesa Jaya in Pulai — saw its launch postponed from February this year to next year. The freehold project by Liang Siang Capital Sdn Bhd consists of 18 units of 2-storey semi-detached houses with land areas of 3,520 to 5,162 sq ft, and built-up areas of 3,102 to 3,601 sq ft. Prices range from RM1.01 million to RM1.25 million. KGV International’s research shows there are more than 100 registrants for the project. According to Tan, notable launches during the quarter were UEM Sunrise Bhd’s Estuari Garden 2-storey superlink homes and Senibong Hills Sdn Bhd’s 3-storey courtyard homes. Estuari Garden is composed of 83 units of superlink homes with a standard lot size of 24 by 75ft. Their land area is 1,800 sq ft, while built-ups range from 2,708 to 2,989 sq ft. Prices are from RM1.35 million to RM1.8 million, with an 8% rebate and waivers on sale-and-purchase agreement, memorandum of transfer and loan agreement fees, and air-conditioning units for all rooms except for the maid’s room. “This is one of the few landed residential developments to be launched. Prices reflect the scarcity of such properties,” Tan says. The freehold Senibong Hills at Senibong Cove consists of 55 units of 3-storey courtyard homes and 3-storey garden terraced homes. The courtyard homes will come in two lot sizes: 35 by 85ft and 35 by 65ft. The units with the larger lot sizes have land areas that range from 2,975 to 5,036 sq ft and built-ups of 4,590 sq ft. They are priced from RM2.53 million to RM3.73 million. The courtyard homes with the smaller lot sizes have a land area that ranges from 2,275 to 2,845 sq ft, and a built-up of 4,205 sq ft. These are priced from RM2.3 million to RM3.59 million. Last but not least are the garden terraced homes that have lot sizes of 23 by 106ft and land areas of 2,438 and 5,355 sq ft and built-up of 4,030 sq ft. Prices range from RM2.24 million to RM2.7 million. The units are currently open for booking. “This scheme shows a new concept within the popular Senibong Cove, which is jointly developed by Walker Group and Iskandar Waterfront Holdings Bhd. Senibong Hills had good response, considering the pricing,” Tan notes. 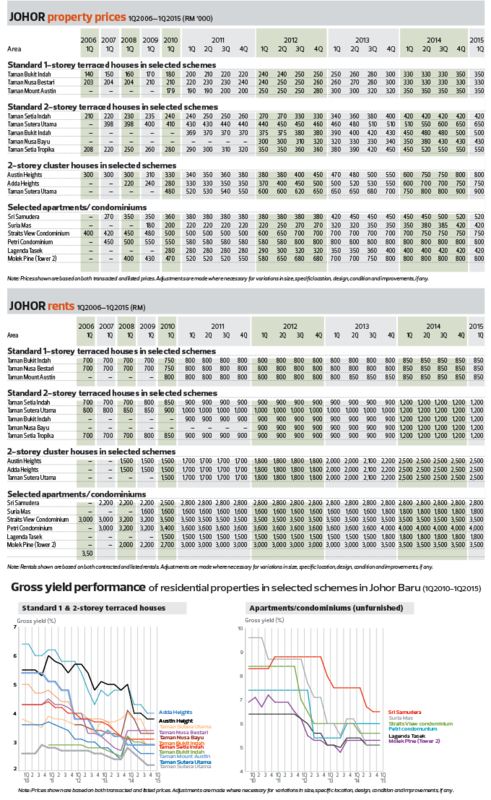 While the property market in Johor Baru during this period was muted, it was not as uneventful overall in Johor. Sunway Construction Sdn Bhd was granted a RM170 million contract to design and build the Coastal Highway Southern Link, which will connect parent company Sunway Bhd’s massive Sunway Iskandar township directly to the Second Link. “This will spur the areas to grow, especially in Iskandar Malaysia-Medini area. Travelling time will be much reduced and Sunway will benefit the most,” Tan says. Another major player, UEM Sunrise Bhd, launched the 4,500-acre Gerbang Nusajaya. “This area is where Singapore’s Ascendas and UEM Sunrise jointly developed the Nusajaya Hi-Tech Park and the sale rate is reportedly commendable,” he observes. Meanwhile, Kuala Lumpur Kepong Bhd swapped its 2,000-acre tract in Frasers Estate, Kulai, for a 500-acre parcel in Gerbang Nusajaya. Reports of an oversupply in high-rise houses led to more developers postponing or reviewing plans for such projects. While this problem had been building up since last year, a report by Maybank Investment on the glut — led by Chinese developers Guangzhou R & F Properties and Country Garden — and price wars in Iskandar have revived concerns among investors. “Yes, the serviced apartments are over-approved and over-supplied, while the landed residential sector is still within reasonable range,” says Tan. “Notwithstanding the above, it does not mean serviced apartments will not be in demand. The main criteria are location and selling price. If they are developed in areas where locals stay and the selling prices are within their means, these properties will still be popular. Some projects have also been scaled down or postponed. For instance, Country Garden’s Forest City was scaled down by 30% to 3,425 acres. However, Tan says, it is not the size of the project that matters, but its contents that will determine whether it can draw regional or international attention. “Personally, I do not think Forest City should be designed merely for the local market. It should be seen as a property where the global rich are attracted to invest in Iskandar. As a result of their investment here, there will also be spin-offs in the other sectors such as services and manufacturing,” he says. There are plans to build a Customs, Immigration and Quarantine (CIQ) complex on the island, according to reports. “If the CIQ centre is used as a transport hub for the rapid transit system linking to the bus rapid transit system as well as the proposed light rail transit and other modes of transport like trams within the city, it would impact JB tremendously. The surroundings will be made into a vibrant destination to buying into the ‘Malaysia, Truly Asia’ tagline,” he says. On Guangzhou R & F’s Princess Cove, Tan says, the project is being developed very slowly. Owing to its position at the entrance into the city, which is the gateway to IM and Malaysia, a negative impression will be created if the project is halted. It will further reinforce the perception that the China-based developers have flooded the market with too many serviced apartments. “We are at a stage where people are adopting a wait-and-see attitude. This comes on the back of the many changes in the economic climate of the world — the weakening ringgit, the drastic drop in fuel price where Malaysia is a net exporter and the implementation of the Goods and Services Tax causing cost of living to increase. The earlier cooling measures such as curbs on end-financing, abolition of the developer interest-bearing scheme, increase in Real Property Gains Tax, are still affecting the property market,” he says. According to Tan, places populated by locals continue to be hot spots, with demand staying resilient. Currently, the favourite areas are in the Taman Austin locality, Bukit Indah/Nusajaya, Permas Jaya, Southern link and Skudai/Tampoi areas. “In future, areas such as Pasir Gudang, Sedenak, Ulu Choh will be attractive to those interested in affordable housing,” he says. Meanwhile, the Napic Property Market 2014 report showed a jump in transaction volume of commercial properties — to 3,068 from 2,562 units on an annual basis — compared with a huge fall in value to RM4.9 billion from RM10.1 billion. “This gives the impression that the commercial sub-sector fared badly in 2014. In reality, shopoffices that are one to six storeys tall fared better in 2014 than in the preceding year,” he says, adding that transaction volume rose 30.2% per annum, while values rose 57.5% to RM2.2 billion from RM1.4 billion. “The drop in the overall transaction value was due to the other property types such as purpose-built office, shopping complex and, particularly, commercial land. The [last category] showed that investors were careful in landbanking, especially for serviced apartments or shopping centres,” he says. There was an announcement by the state announcing a freeze on any approval of serviced apartments. Even so, those approved previously are allowed to be developed. “Personally I feel a blanket freeze is too drastic. In areas where there is demand, they should be allowed to be developed,” Tan opines. This article first appeared in City & Country, The Edge Malaysia Weekly, on June 8 - 14, 2015.